Well, Drew started soccer and though it was nerve-wracking at first, it wasn’t all that bad. They performed some drills and Drew enjoyed kicking the ball around and even practiced playing goalie. He wasn’t able to run the warm-up lap which made me worry at first that this would be the moment his shoulders would slump in defeat, but Drew didn’t seem phased. He had a great time! Shortly before his first soccer practice, we had a major incident with Drew’s brace. I received a call from Drew’s aide at school who explained that “the plastic piece on Drew’s brace just broke.” I immediately called the orthotist but alas, they are closed on Fridays. It was only when Drew got home did I realize just how bad the break was. It wasn’t the plastic piece, it was the metal bar and it had snapped below the knee-joint rendering it completely unusable. The ramifications of this are great. Drew is 100% reliant on these braces and no ability to reach an orthotist until at least Monday and then who knows how long it will take to order and receive a new part and arrange to meet a technician in a nearby location to assemble it. Nathan and I pondered solutions to help bide our time. It was metal so we knew no amount of glue would repair it. Nathan considered some type of metal sleeve in a feeble attempt to secure it, but that idea was too far-fetched. Nathan finally started a search for a welder and was able to locate one who could weld aluminum in our county. When Nathan returned home with Drew’s repaired brace, we were excited and during the weekend and soccer practice on Monday, we held our breath wondering how well it would hold up. It seemed to be holding up beyond expectations so I forgot about calling the orthotist and we carried on. Exactly one week later, as we were waiting for the bus, I let Drew talk me into kicking the ball around in the driveway as we waited for his bus. Just as I bent over to pick up the ball, I heard a snap. I turned around and Drew was belly down on the driveway and began to sob. Luckily, he managed to keep his face up so he avoided face-planting the driveway, but the impact to his chest and belly was painful. The weld on the brace had broken once more. I quickly removed Drew’s braces and he went to school with no braces for the first time (I think.) Drew said the kids were fascinated with Drew’s newly naked legs and were curious about all of his scars. I immediately returned to the welder in hopes to get them repaired once again. Of course, now I knew that we’d have to call an orthotist for a more permanent solution, but naturally, this occurred on a Friday so the orthotist was closed. The welder spent two hours welding and rewelding again and again as he just couldn’t get as good of a joint as before so I was warned that it may not last long. Drew was instructed to take it easy – no running or jumping – and I expressed my worries about letting Drew attend soccer practice lest it break again. It was a long weekend, it seemed but finally Monday arrived. And then, something even worse happened. Dr ew’s power wheelchair went kaput. 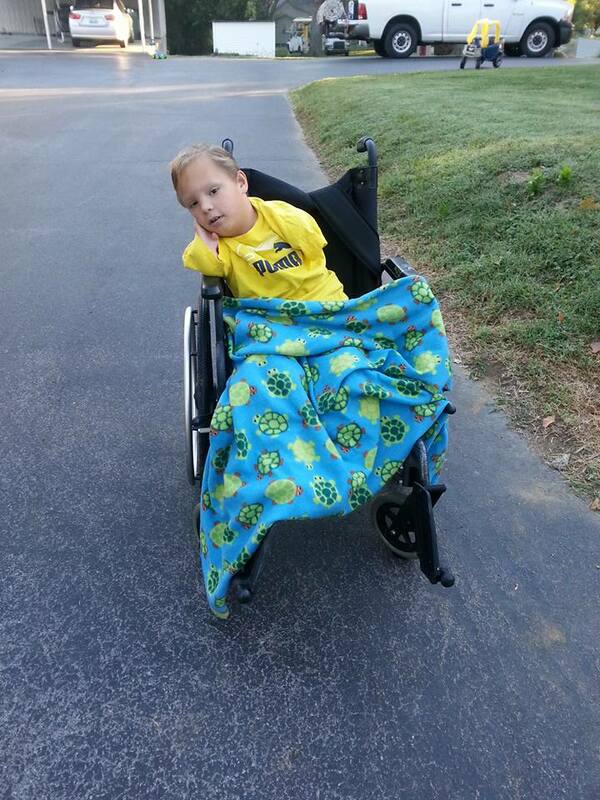 Without Drew’s braces and power wheelchair, Drew is wholly dependent. This meant he has to be carried to and from room to room, he can’t participate in recess or gym, and for a boy who I swear is pure lead within his skin he’s extremely difficult to lug around. Luckily we had a manual wheelchair, but this is a dire situation. I called the orthotist right away and expressed how urgent the matter was. Somewhere in the back of my mind, I feared that the one and only time to fix Drew’s braces would be Thursday. Why did I fear this? Because Thursday is school picture day as well as High Attendance Day, a day that the school strives for perfect attendance. And, things are always more complicated if I am involved so I was only half surprised when the receptionist mentioned this was the only day available in the next two weeks. I would need to meet the technician in Louisville, a three-hour one-way drive for me (and they’re an hour ahead of me so that’s four hours knocked off my afternoon. Well, as disappointing as missing school picture day is and naturally, now Drew will be the only absent student on High Attendance Day (because that’s my luck), Drew’s braces are priority. I contemplated this for a bit when I pondered whether it was necessary to have Drew there. After all, they’re going to remove the metal bar and replace it with essentially the same bar so perhaps Drew didn’t need to be there to confirm fit? So I shot off a text to the technician and he had an even better solution for me. He could ship a box, shipping paid, 1-2 day priority to me to place his brace and ship it 1-2 day priority back to him to replace and he’d ship it right back to me so we’re looking at 3-5 day turnaround time and the best part is it saves me the arduous trip to and from Louisville. Boom! I danced in my seat at this exciting hack we’d manufactured. I also called to have his wheelchair serviced which will be the end of next week. Ok, problem solved. 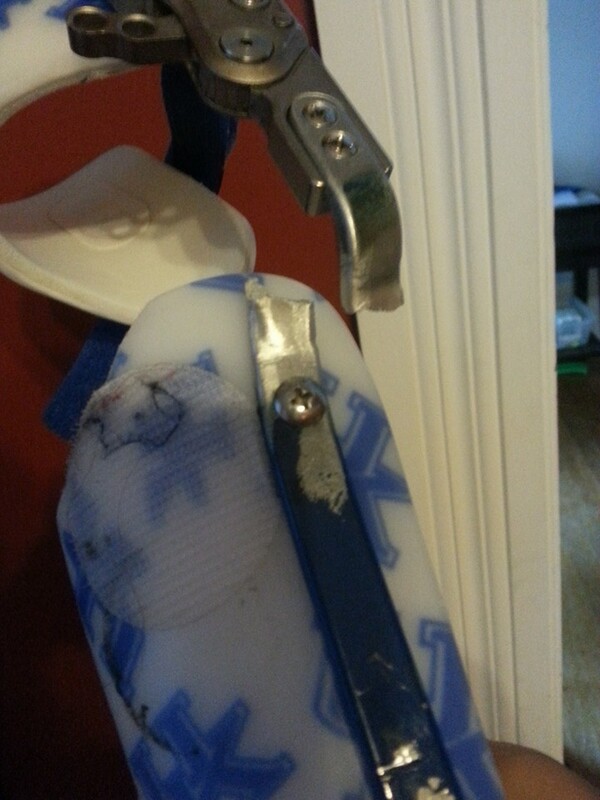 I don’t have to make a long trek to fix Drew’s brace, Drew had a temporary fix so he’s able to walk. I was sitting pretty. I was so arrogant that out of weakness, I let Drew attend soccer practice in hopes that his brace will hold up. Well, I’m not quite sure why I can be so acutely aware how utterly inconvenient every aspect of my life can be yet just ignore the facts because of course, ten minutes into practice the weld failed. Sigh… I could hear Nathan silently mocking our conversation about NOT risking soccer practice. I anticipated his taunting. Drew was devastated to have to sit out the remainder of practice. At the end of practice, the coach was going over some details about the first soccer game this Saturday when it occurred to me that there was a chance we wouldn’t have his fixed brace back in time for the first game. And, I can’t have just watched Drew sob tears of disappointment at missing only his second soccer practice without my heart breaking at the thought of him not joining in on the game. So, what does a devoted mom do? I immediately called the orthotist and advised them to not send the box as I will be making the long trek to Louisville after all to ensure his brace is fixed in time for his first game. And, can you believe that after all this – agreeing to skip the convenient and free option to mail the brace for repair to instead drive 320 miles with a two-year old in tow that he wouldn’t give me his Milk Duds he collected during our local Corn Festival parade he watched?!? 😉 Boys! Last night, I was casually scrolling through Facebook when I came across a job opening posted on our local yard sale page. I’m not currently in search of a job and don’t foresee being able to reenter the workforce until Holden goes to school next year, but I stopped to read the details none-the-less. It was a job at our local newspaper for office work including newspaper design, some work on stories, and general office duties and immediately I want this job. Sorely. I live in a very rural area and having graduated with a bachelor of arts from a four-year university, the opportunities for professional work is slim. This is a very blue-collar area, which is fine – no judgement. But when you’ve spent $50,000+ on a college degree, you become selective and reject anything that doesn’t fulfill your skill level. It has been my biggest fear that I will be unable to avoid having to work at a fast food joint for spending money, which is the ultimate insult when you have a college education. It wasn’t my choice to leave my last career, which I loved, which I viewed as the most professional career I could achieve in this area. Seeing this position available for the taking right now and not being able to pursue it is like watching the very last potential enjoyable job just disappear before me. I literally feels like this is the last one ever and now I’m definitely doomed to be serving fries with that. I briefly considered putting Holden in daycare for the day. After all, it’s just for every three weeks while Nathan is on the boat and when he comes home for his 21-days, then he’ll keep Holden so I’ll be spending half in daycare as any other household who uses daycare. But, the excitement was only momentary as in the next year we’re anticipating five surgeries for Drew, three of which will be performed in Florida requiring a minimum two-week stay, perhaps longer. And, we have a follow-up in Florida in January. And, one surgery in Cincinnati will surely take a few days during the week. And, there are these random unexpected urgent trips to places like Louisville to repair braces. I can’t go into a job expecting that they grant me so much time off. I shed tears of disappointment. I love my family and they are my top priority, but it was a hard pill to swallow to consider for the first time that I may never get to work again due to Drew’s unique medical needs and the impact it has on our lives. I don’t regret anything and I would never put anything before Drew, Holden and Nathan, but I do wish I could just have it all. But, after I get over my initial disappointment, I’ll bounce back and while I’m clapping in support of Drew at his first soccer game and playing peekaboo with a giggling Holden, I remember that, after all, I have everything I will ever need!